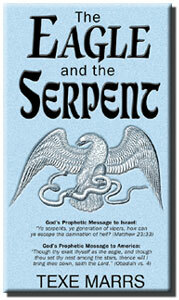 The Eagle and The Serpent�America and Israel In Bible Prophecy: An exclusive, three-part series by Texe Marrs. Are the prophetic destinies of the United States and Israel intertwined? Does the Bible prophesy that the people of the physical nation of Israel will suffer an accursed fate because of their unbelief and their hatred of Jesus the Messiah? Was it prophesied that America would rise up to become the world�s greatest superpower, so powerful and mighty it rivals the achievements of the ancient Roman Empire? Were Jews fated to become the most wealthy race of people on earth�the world�s jewelers, bankers, and financiers? Will the Jewish Power encompass the earth, empowered by its secret control over the U.S.A.? Will the Jewish elite target and persecute Christians everywhere? And this stunner: Will a mighty America and its leaders eventually turn on and attack its ally, Israel, savagely destroying that nation with fire from nuclear weapons? Will Israel become the victim of end-time America�s fury and rage?